Alert! Here is one of my over-detailed public posts which I write after we go places, in the hope that the information might help other people, especially people who try to get places by public transport. 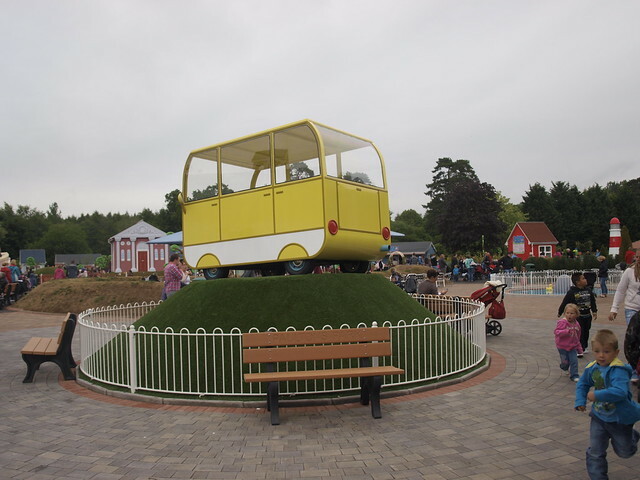 This was my first theme park experience ever - and until we can get to Moomin World, it'll probably be the last. I don't remember exactly when we saw our first ever episode of Peppa Pig, but according to Wikipedia it first aired on Channel 5 the year before Item* was born. I do remember a short period when it registered only as crass and annoying and unaesthetic: in particular, I remember disliking the lines around the pigs' mouths (which appear when the mouths are open), and the simplistic, repetitive theme tune. It didn't stay that way for long, though. Once we'd watched a few episodes, we cottoned on to the sardonic humour and solid characterisations. 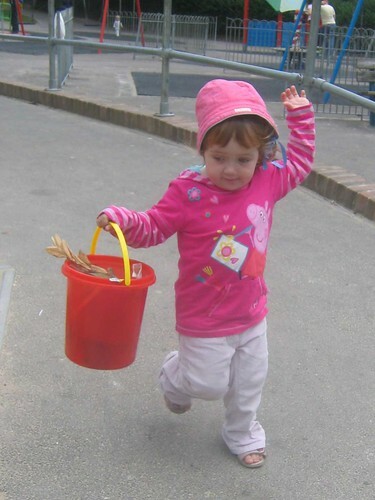 Item enjoyed it when she was 1, and she enjoys it now she's 6 in a totally different way. Back then, it was presumably about the characters' bright, flat colours and easy-to-grasp storylines: now, it's partly about sharing the enjoyment with an adult who's laughing too. Over the past few years, watching the two episodes that are aired at breakfast time has become the before-school norm (I know, lax family, aren't we? ), and we've become familiar with even the most obscure characters. Item also has many of the tie-in toys, mainly, I have to confess, because I find them really pleasing. Although, they do have their faults, I suppose because of the difficulty of creating a 3D figure that will stand up with tiny feet and a huge head. 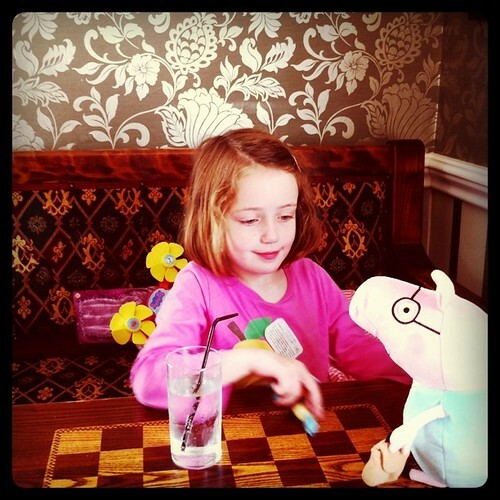 I predict that she'll always look back on Peppa Pig with fondness (such is the stuff that future pub-reminiscing will be made of, no doubt), but we also notice that she's just about growing out of the programme - we are now very much enjoying Ben and Holly, a slightly more grown-up series from the same production company. 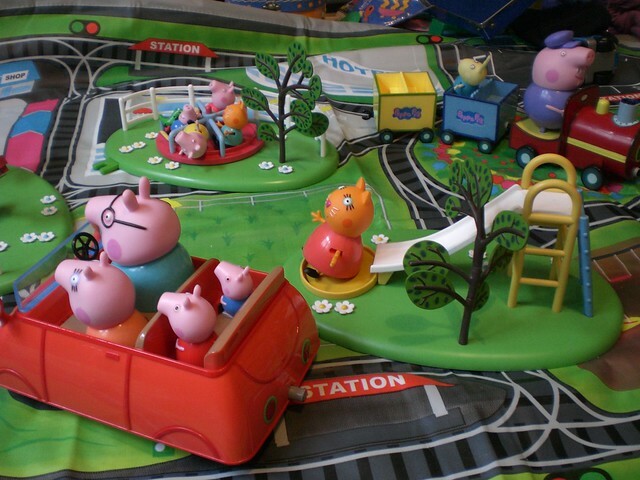 So when we heard that a Peppa Pig theme park had just opened up, we knew this was probably the last year we'd get the full value out of it. Honestly? I wanted to go myself, and all the more so when we watched the promotional videos on YouTube. It all looked so surreal. Plus, whatever it is I like about the small figures we play with at home was magnified in the adult-sized figures that are dotted around the park. 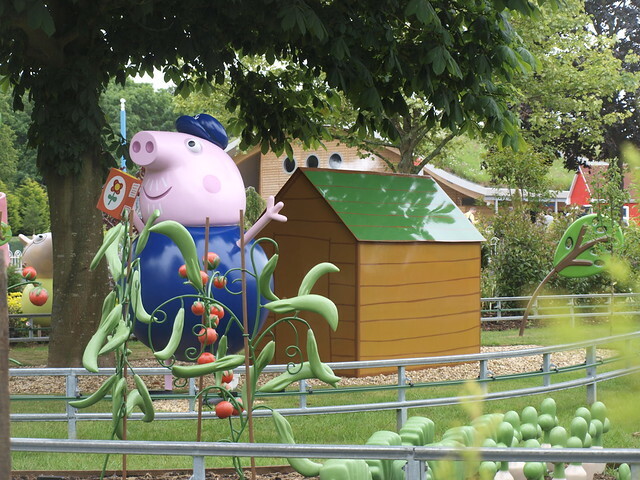 Peppa Pig World is actually just a small corner of Paulton's Park, a theme park just outside Southampton. That's about two hours by train from Brighton, though, so we decided to make a trip of it and get some fun for the adults too by booking into a nice hotel. The easiest thing seemed to be to stay in Southampton itself, from where we could bus or taxi it to the park. There are hotel and park ticket deals on the website, but we spotted a Mercure hotel in Southampton, the same chain we'd stayed in in Dieppe, and fancied treating ourselves to it - and we discovered that by booking 30 days ahead, we got 30% off. We were really lucky with the hotel: in Dieppe, we'd had a normal-sized room with a sofa bed for Item. Here, we had two massive rooms, our own *corridor* and a plush bathroom, presumably because it was a term-time Sunday night (Item's school had an INSET day the next day). To be honest, we didn't manage to do much in Southampton itself: we arrived too late in the day to go to the art gallery, which looks like the best bet for kids, with trails they can follow, and I was the only one who fancied looking at the mediaeval merchant's house or Tudor house. If it hadn't been a Sunday, we could have gone to late night opening at the very central Ikea! But we wallowed around in our room and then went for a walk to the waterfront, where we mainly found the industrial ferry terminal. On the other hand, we also found a playground, the novelty of which was enough to keep Item very happy. Southampton does mainly appear to be a selection of very large shopping malls, intercut with grim postwar buildings and the occasional historic, but bombed, structure. Our taxi driver spoke glowingly of its outer reaches, but of course we didn't see them. We kind of failed at dinner as well. I wish we'd gone the whole hog and experienced room service: I've never had it, and the menu looked good. But in the end The Boy went and got a burger for himself, and Item and I had a Tesco picnic in our room while watching Antiques Roadshow. Never mind, breakfast is excellent at Mercure hotels, if somewhat pricey - slightly mitigated by the fact that kids eat for free. I expect they knew that Item would choose one fried egg and one starwberry, and then dip the strawberry in the fried egg and deem them both inedible. She did down a yoghurt drink though. Journey out, taxi from the hotel, quoted price of £17-18. We hit a totally unexpected traffic jam, Item puked up strawberry and yoghurt on the back seat (thank you, very kind taxi driver, for only becoming very very slightly less kind), and the driver decided to double back on a different backroad route, finally dropping us at the Paulton Park gates, since the jam continued up that driveway. Cost: £35, plus a hefty tip for cleaning the seat. And the walk was negligible when it came to it; we really shouldn't have let it put us off. Journey back, bus from the bottom of the same driveway. Very clear timetables and a text-to-know-when-the-next-bus-is-coming facility - the bus is hourly, something else that had put me off, but which in retrospect was just fine; we just kept an eye on the clock and timed our exit carefully. Plus, there's a pub, the Mortimer Arms, opposite on the same road where you can while away any extra time (and incidentally, they have rooms, so it's another accommodation option). Total cost: £6.00. Item travelled free. The bus passed the station, and dropped us off in the centre of town. Only one other family was at the bus stop with us, against hundreds and hundreds of cars in the carpark. But wait a minute, why, given that we'd been oh so very clever and come on Item's INSET day, were there cars parked as far as the eye could see? We don't know, but our best guess is that it was also an INSET day in Hampshire, since Twitter mates tell us that they had had a much less busy visit. Plus, there is actually a bus stop outside the entrance, but it seems the bus only comes up that way during term times (erm, why?) and it certainly wasn't coming up that Monday. 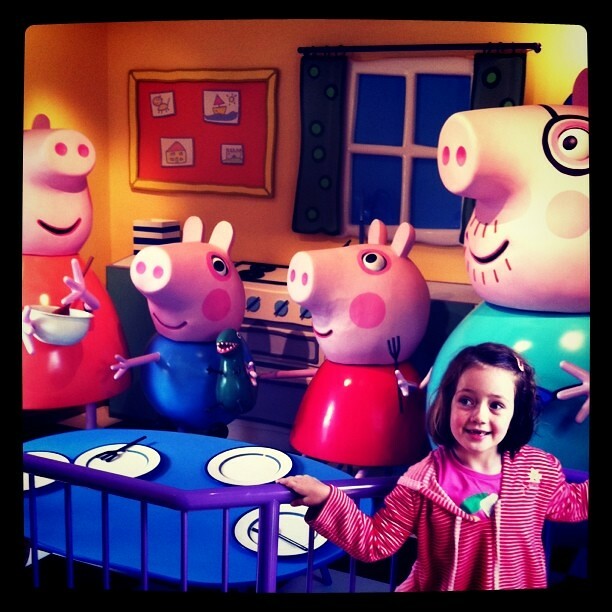 What is Peppa Pig World like? You know what? It was absolutely brilliant. 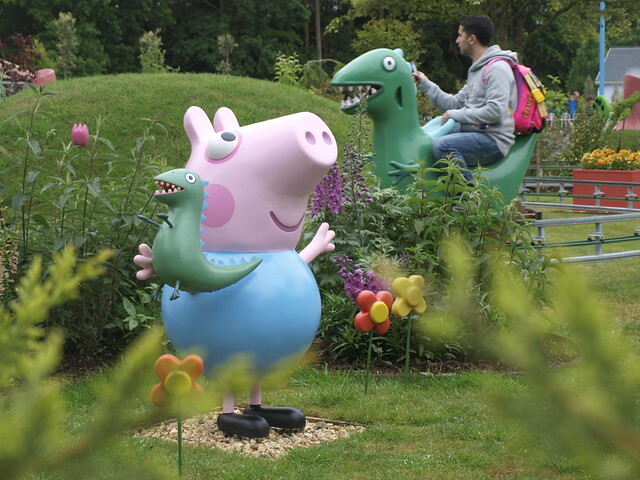 They might have been tempted to phone it in, putting out generic rides but with a few Peppa characters painted on the side. But no, they had gone all out. 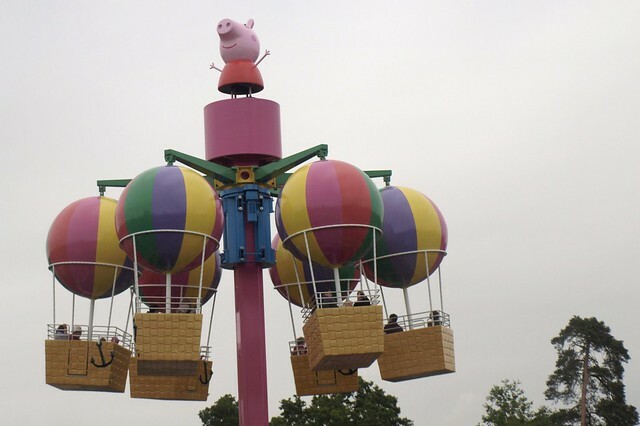 There were flagship rides which were just truly stunning to look at: Windy Castle, Mrs Rabbit's Helicopter Ride, and Peppa's Big Balloon: they towered above the park looking unlike anything you've ever seen before. Then, at ground level, there were buildings made to look exactly, in every detail, like Peppa's house, the school, the museum and so on. Actually, the attention to detail was really pleasing. Even the safety announcements were voiced by the same bloke who narrates the cartoons. 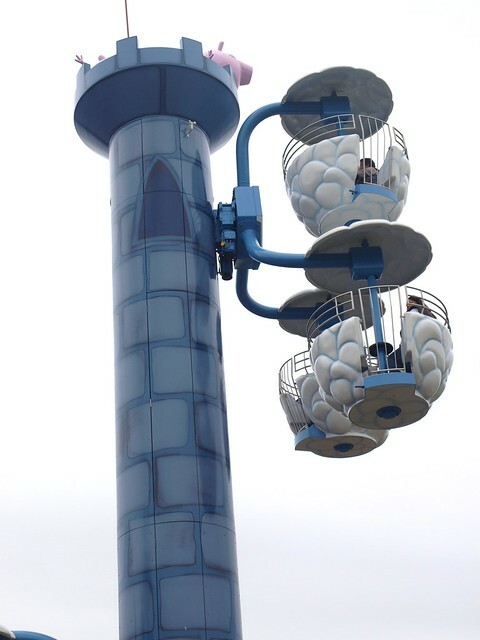 Also, the theme tune, 'Big Balloon' and other PP favourites were piped across the whole park, giving it a kind of Tokyo subway feel. There are figures galore, adult height, all in the same delighted position, arms up at 45 degrees: whichever character you're fond of, no matter how minor, you'll find them here. I loved that the trees, flowers and ducks were slavish copies of the 2D world depicted in the cartoon. The only downside was the queues. 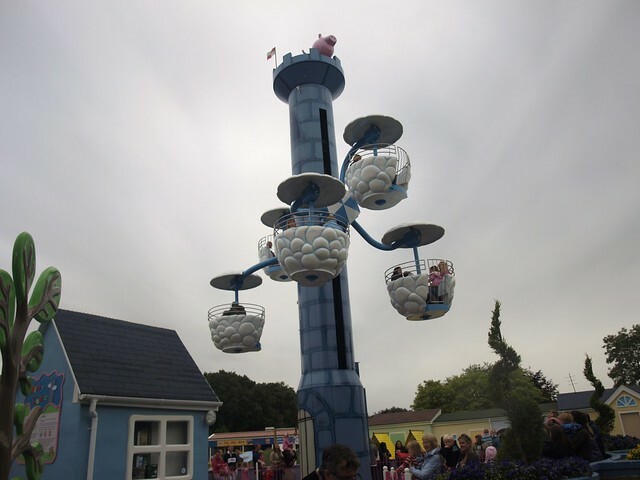 As it happens, Item was reluctant to go on any of the high rides (though, if there had been no queues, I would have been keen and I reckon I could have persuaded her to join me). The park obviously expected queues on busy days and had used its experience to manage them well, doubling them back on themselves and keeping everything orderly. 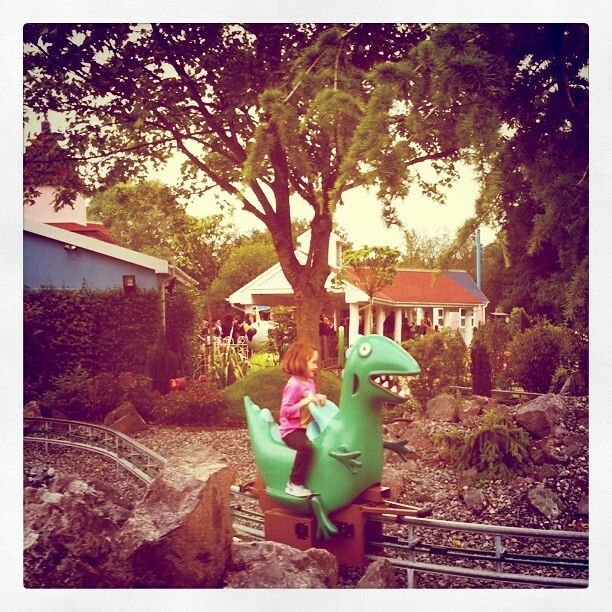 But it was very dispiriting to wait for an hour to go on a four-minute ride - that's what happened with George's dinosaur ride. I'm glad we did one ride, and this was fittingily surreal - each of us climbed on a small green dinosaur and was taken around a track, first through Grandpa Pig's garden and then through steaming volcanoes. We missed riding in the cars or the boats, because that would have meant investing another two hours in queuing. To be fair, this has not dented Item's enjoyment. 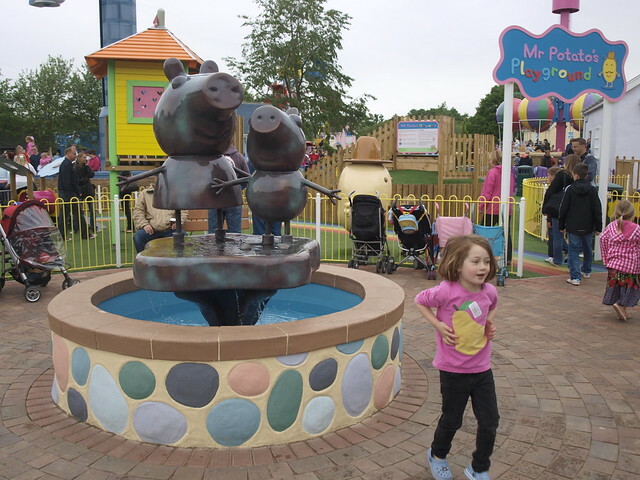 There were other things to do: a water park, in imitation of the muddy puddles that Peppa and her family jump in at the end of most episodes; an indoor play area with some a superior ball-pit utilising air to make the balls hover and rush through transparent pipes; a decent playground. 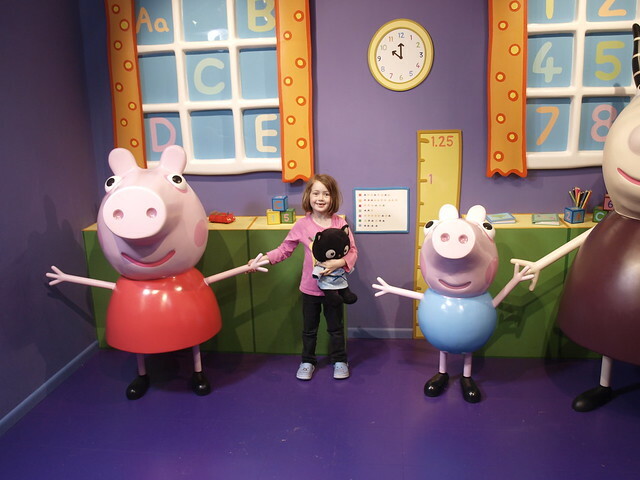 Then you could have your photo taken inside the school house or go and watch animatronic pigs speaking in Peppa's house. We came away very happy with our day and with a shared family experience we'll talk about for a while. Apart from the queues, our only disappointments were the cafe (bland, over-priced food; bring your own, although the coffee was surprisingly acceptable) and a kiosk in the middle of the park where you had to pay to have a go at a ball-toss competition that was one of those takes 10 seconds, costs £2, and you haven't won anything deals. But in short, highly recommended. Especially if you can be wiser about the day you choose than we were. *Not her real name, no.